Engraved. American Bank Note Company, Perf. 12. Design. 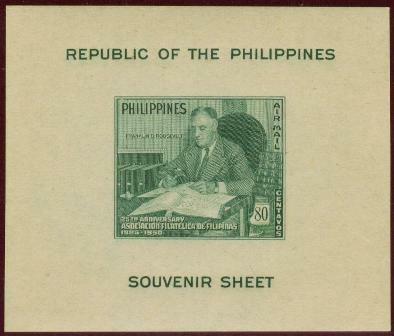 Depicts United States President Franklin Delano Roosevelt as a Stamp Collector. President Roosevelt was an Honorary Member of the A.F.F. History. Founded in 1925, Asociacion Filatelica de Filipinas (AFF) was conceived under the initiative Don Joaquin Ortiz. The preliminary organization meeting of the Association was held on April 19, 1925. It was held at the office of Don Joaquin Ortiz, at 116 Sta. Potenciana St., Intramu­ros (Walled City), Manila. Three weeks thereafter, on May 10, 1925, with a handful of Manila collectors, the Association was duly organized. Its organization was held at the pre­mises of the Hotel Palma de Ma­llorca, in Intramuros, Manila. Among its original organizers were: Dr. Ricardo A. Reyes, Don Juan Mencarini, Don Remigio Garcia, Don Domingo Quintos. Don Joaquin Ortiz, Mr. Charles Banks, Don Emilio S. Mallari, Mr. Mi­chael Goldenberg, Don Manuel Lim. Don Jose Castaner, Don Angel Mar­tinez, Don Agripino Mendoza, Don Cayetano Soler, and Mr. Sy Eng Kiy. It’s no secret that long before he held public office, Franklin Delano Roosevelt was an avid stamp collector. What’s more surprising is how the man who would become America’s longest-serving president changed the nature of stamp collecting forever. Roosevelt began collecting as an eight-year-old, when his mother introduced him to the hobby. Sara Delano Roosevelt had been a stamp collector as a child, her collection bolstered by her father’s frequent trips to the Far East. “At the time, collecting was thought to be a child’s hobby,” says Anthony Musso, author of FDR and the Post Office, a historical account of Roosevelt’s devotion to stamps and the Post Office Department. FDR’s collection grew, and several years later, he received his mother’s collection, which was passed to him through the hands of her younger brother, Frederic. Even then, Roosevelt used stamps as educational tools, putting one or two stamps on a single page of an album and annotating the rest of the page with notes about the history of the person or event depicted in the image. Historians point to this self-education as a key to Roosevelt’s political strength and success: It equipped him with expansive knowledge of geography and the international community. What’s more, says Musso, “Roosevelt got great personal enjoyment and intellectual satisfaction from his stamps.” So great was the future president’s passion that in four separate personal letters, he credited stamp collecting with saving his life after his polio diagnosis in 1921, when Roosevelt was 39. “I owe my life to my hobbies — especially stamp collecting,” he famously said.